BEAVER BHPD-20 Model, Channel Mounted Pneumatically Operated Horizontal Drilling Rig can capable of drilling from 3” to 4” Dia. Bore Holes in medium to hard rock formation by DTH method up to a depth of 6 Meters (20 Ft.) under favorable Drilling Conditions. 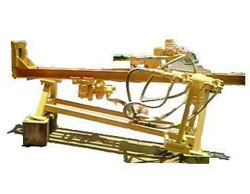 It is the portable, easy to move and very cost effective for horizontal drilling applications. It can be useful for different kind of applications like mining, construction, grouting works..etc.